Twitter celebrated its 7th birthday last week but at the same time as the candles were being blown out in the Twitter office an employee from the Evening Standard was being suspended after prematurely revealing details of George Osbourne’s budget. We’ve recently seen the dangers of good tools in careless hands, for example employees at HMV hijacked the company Twitter feed to vent their frustrations with the collapse of the business and there are countless cases of celebrities getting into Twitter trouble. In a time where digital technology rules our every day lives and at the click of button we can distribute and connect with people from all over world, where should we draw the line? 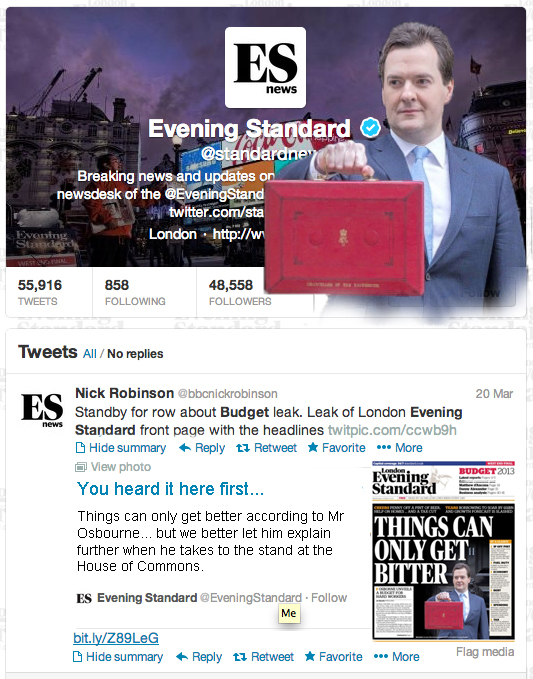 The Evening Standard has – apparently – immediately suspended the person responsible for tweeting the front page of Mr Osbourne’s budget but it was too late – like a toxic virus it was pinged around news rooms and before he even took to his feet, Labour were waving the front page in front of him. So with an embargo broken, an employee in trouble and a newspaper under review – Twitter has made the headlines again. But is it really the fault of the social network or just user misuse? Social media has become a normal function in most professionals’ lives; internal and external communications alike are using the platforms to collaborate and communicate messages across the web to get things done. That’s what it is about helping to get things done. The latest issue involving the Evening Standard is merely another demonstration that many employees are not educated enough on the power of social media, even if they are aware of how to use it. This is a problem that organisations should be addressing and not be assuming that employees already know this just because they use it in their personal lives. Corporate policies can be used – especially in terms of offering guidelines and setting expectations – but it is more about engaging with employees on the functions and power of digital communication in a non-corporate way. Let’s face it – how many employees actually take the time to read the 100 policies that a company offers just because it’s on the server? Policies may detail what is, and isn’t, acceptable behaviour for social media but the true power of social media and the impact a mistimed or misused piece of communication can have can only be shown in real life examples. The challenge for employers is that social media is embedded in to people’s everyday life away from the office and while some of us have enough common sense to know what should and shouldn’t be put online, a lot of us don’t and therefore the lines become blurred and mistakes happen. It’s an exciting new digital world – but it’s surrounded by dangers. A normal day at the office can turn in to a PR disaster or thousands of digital impressions and a tidy pay rise. Employees need to understand what their corporate virtual profile has the ability to do – both intentionally and unintentionally, if they’re to make sure they aren’t leaving themselves, and their employers, vulnerable to attack or investigation. Social media is no longer a separate part of marketing or communication, it’s just part of what we do on a daily basis. Used right, internal corporate processes can be shortened with improved working collaboration and external business can spike with timely communications like @oreo at the Super Bowl. Used wrong and it’s a whole different story.